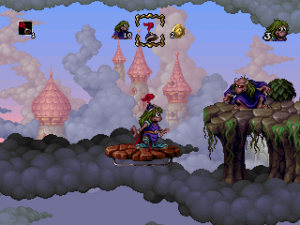 The lemmings have starred in numerous games, on tons of consoles and computer platforms. They’ve had a reasonably smooth transition to 3D that lesser games could only dream of. They’ve even had two of their own choose-your-own adventures. Where else could the lemmings possibly go from here? 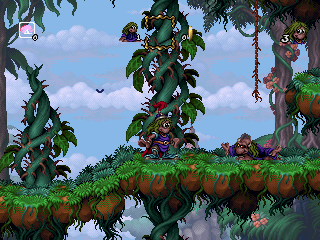 Well, how about a platformer? This game is actually sort of a spiritual sequel to an Amiga/Sega CD game called The Misadventures of Flink, also published by Psygnosis. 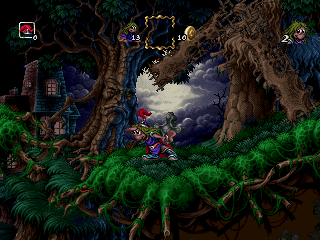 While the gameplay’s different, they share a very similar art style, courtesy of pixel artist Henk Nieborg. The primary antagonist is Evil Ed, the vile lemming sorcerer, who has cast an evil spell over the lemmings of the land, turning them into his mindless slaves. Lomax, the last free lemming, must travel the land, free as many lemmings as he can from the spell, and finally defeat Evil Ed. Compared to previous Lemmings games, which showed the world the lemmings lived in as a surrealistic place, full of weirdness and danger, this game shows it as more of an actual living world. It would have been cool if Psygnosis could had reused the whole ‘tribes’ concept for ideas on level design, but the route they took ends up working fairly well, too. 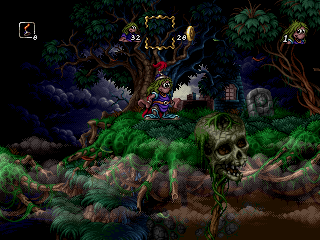 In this game, the world of the lemmings is a bright, colorful, medieval-looking place with canyons, forests, and graveyards, which contain a disturbingly high number of human bones. That’s never really explained. The game is divided into four worlds, for a total of 22 levels. Each level is divided into a number of smaller stages, usually two or three. 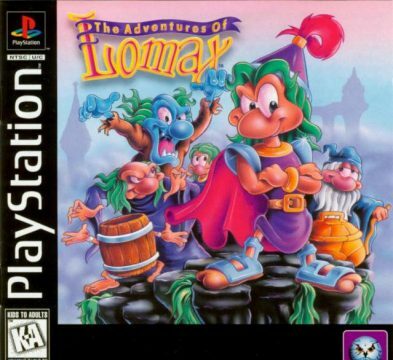 The goal of each level is simply to bring Lomax to the end. Unlike something like Rayman, where you’d have to spend hours scouring each stage looking for cages and other secrets, that’s really all you have to do. Quite nice, really. As you’d expect from a platformer, Lomax is controlled directly by you, so he won’t plunge himself into dangerous objects unless you make him. 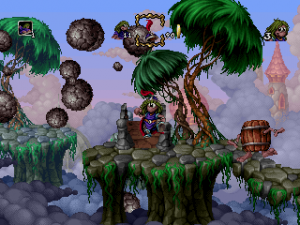 By hitting the jump button in the air, he can do a spin attack that destroys enemies and breaks objects, which he can also do by rolling down steep slopes. Like the rest of his species, Lomax can only take one hit before he explodes spectacularly. 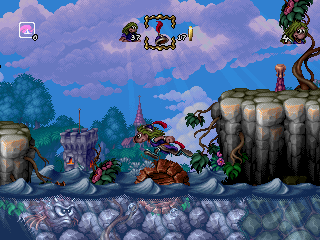 Thankfully, at this point in time, the lemmings have mastered the advanced concept of “wearing a helmet”. A helmet will protect Lomax from one hit, at which point it’s lost. Lomax can hold a spare helmet in the Super Mario World-esque box at the top of the screen; however, it will automatically empty itself from the box if Lomax is carrying a spare helmet. Be careful, though, because unlike Super Mario World, the helmet will NOT track your position before it drops to the ground, so you can easily lose it if it ends up falling out of your reach. There are actually a lot of times when helmets will bounce out of the pots you find them in and off of a cliff before you can reach them, which does get annoying fast. Besides spinning and rolling into things, Lomax can also toss his helmet like a boomerang to hit enemies at a distance. There are special powers Lomax can use while wearing a helmet, which have a limited stock that’s replenished by picking up icons. 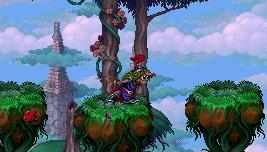 Some are used for platforming, like using the feather on the helmet as a propeller to glide. Others are for combat purposes, like setting the helmet on fire before tossing it for extra damage. Other than the helmet powers, Lomax will sometimes find a couple of “natural” powers, as well. One of them is our old friend, the builder power, which makes Lomax drop floating platforms he can jump on. The other is the basher power, which lets Lomax claw through certain walls of soft dirt. Seeing the classic Lemmings powers used in a platforming context is pretty cool, although it would have been nice to see a few more of them. Obviously the bomber power wouldn’t work out, though. There are also other things Lomax can collect. Coins, as you’d expect, give you extra lives for every 100 of them you find. 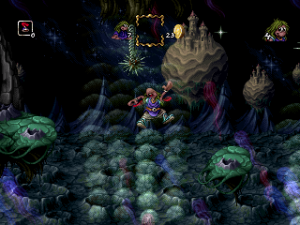 Since a majority of the enemies you fight are lemmings under a spell, attacking them will set them free. 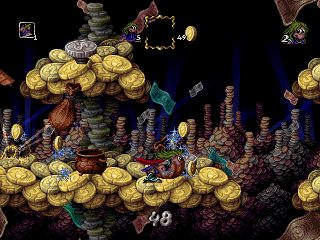 Every time you free 50 lemmings, you get a bonus stage at the end of your current level, which is basically a big room that’s not only full of coins; it’s actually made of coins. These are definitely worth going for, since this is one of those games where your extra lives are worth something. The level design is fairly straightforward, and pretty much all of them involve heading from left to right. That’s not to say that they’re boring, just that you’ll be doing a lot more platforming instead of running around the level looking for things you have to collect. The game does a good job of keeping things fresh, adding in new level gimmicks like bubbles Lomax can ride in. 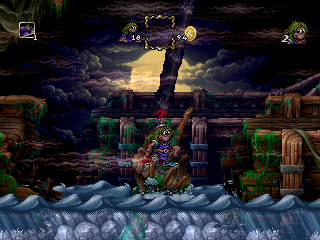 Sadly, the enemy variety is a little poor, with only one or two enemy types per level, although each world has its own unique enemy types that dress up for each world’s specific theme. 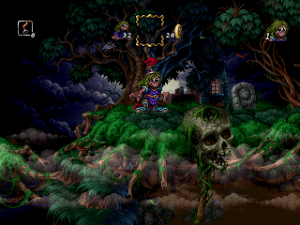 The graveyard world, for example, has a werewolf lemming. When you hit it, it turns into a naked, normal lemming and shuffles off of the screen, Rampage-style. The game starts out easy, but around midway into the second world, it quickly starts to ratchet up in difficulty. Pits start to become more common, until eventually it feels like you’re constantly hovering over one. Sometimes the game feels a little too unforgiving with the amount of precision platforming it’ll want you to pull off, especially since Lomax is just a bit slippery to control. Thankfully, helmets are reasonably common, as are mid-level checkpoints. 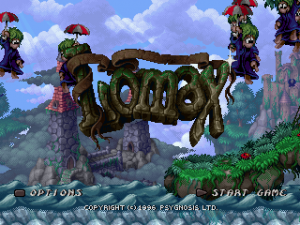 Compared to other 2D platformers on the PS1, Lomax feels much more like a 16-bit game in design, which isn’t a bad thing at all. Although it would have been nice to have more secret things to pick up in the levels, the fact that the level design is focused on moving forward instead of hunting for arbitrary collectibles is quite nice. One thing that would have been kind of nice to have is some good boss fights. 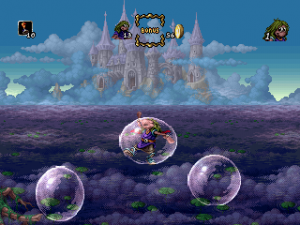 Besides the final boss, the only real fight you get each world is avoiding the attacks of a hot air balloon. It does get harder each time, but still. The game uses passwords, which is understandable since, in 1996, most PlayStation owners probably didn’t have memory cards yet. What’s annoying is that these passwords keep track of the number of lives and continues you have, so if you had a bad run in a level, you might as well scrap it and start over. Or go to GameFAQs and use one of their passwords, which will put you at the default of three lives and three continues. The real highlight of the game is definitely the graphics. Everything about the way Lomax looks is absolutely amazing, and it’s definitely one of the best looking 2D games on the PlayStation. 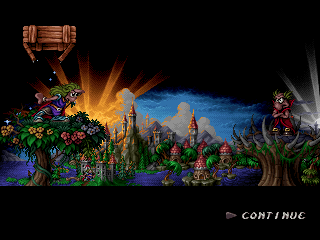 The art was done by Henk Neiborg, an amazingly talented sprite artist who previously did art for Amiga games like Lionheart and The Misadventures of Flink. 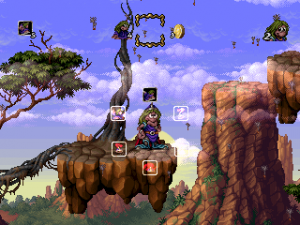 He has a very unique art style, and it’s very obvious from the work he did on this game. The animation for each sprite is incredibly smooth, and none of them ever end up looking pixelated or chunky. 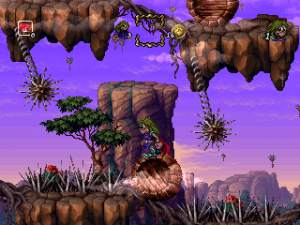 The levels look just as amazing, with parallax included in both the foregrounds and backgrounds. There’s even some very good use of scaling and rotation, including levels where Lomax uses bridges to move in and out of the background. 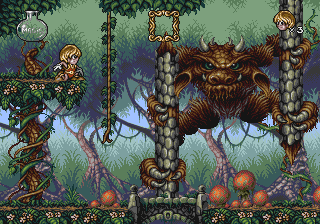 The graphics are better looking than pretty much any 2D platformer at the time, since there’s never any CG or separated sprites involved. The sound and music are decent, although not especially interesting. Overall, Lomax is a fine platformer. 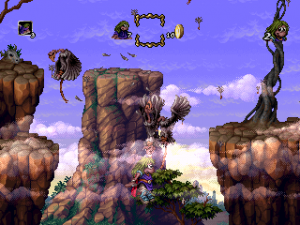 It doesn’t do anything new, and there are a few frustrating points, but it plays well, and it’s worth playing for just the amazing sprite work alone. The PC version and the PlayStation version are nearly identical, although the PC version runs in a window. 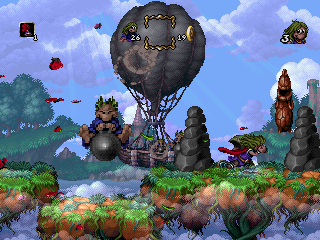 You’ll probably want to go for the PlayStation version, since the PC version has issues on modern computers and, for a platformer, you just don’t want to use a keyboard.